One of the two suspected gunmen in the daylight ambush of Buenavista mayoral bet Atty. Rico Cabarrubias was shot dead by still unidentified assailants in Getafe during the town’s fiesta celebration on Saturday. The fatality, identified as Hermingildo Anuengo, 35, a noted drug personality, was driving a Mio motorcycle with two female Buenavista residents as his passengers when he was shot and killed by two motorcycle-riding gunmen between Barangay Saguise, said SPO1 Ruel Lagura of the Getafe Police Station. Anuengo sustained three gunshot wounds, one each in his head, right shoulder and right arm, while the two women, Crisanta Torradio, a 32-year-old widow living in Barangay Overland, Buenavista and Lea Sumalinog, 19, of Barangay Catigbian, Buenavista were unharmed, Lagura added. Police noted in a report that they found small sachets of shabu with an estimated worth of P2,000 and a .45 caliber pistol inside the utility box of Anuengo’s motorcycle. Anuengo was previously arrested for illegal gun possession and sale of narcotics, police added. According to the Special Investigation Task Group (SITG) formed by the Bohol Police Provincial Office (BPPO), Caburrubias positively identified Anuengo as one of the gunmen who shot at him and his driver along a national highway in Barangay Tulang, Getafe on January 14. 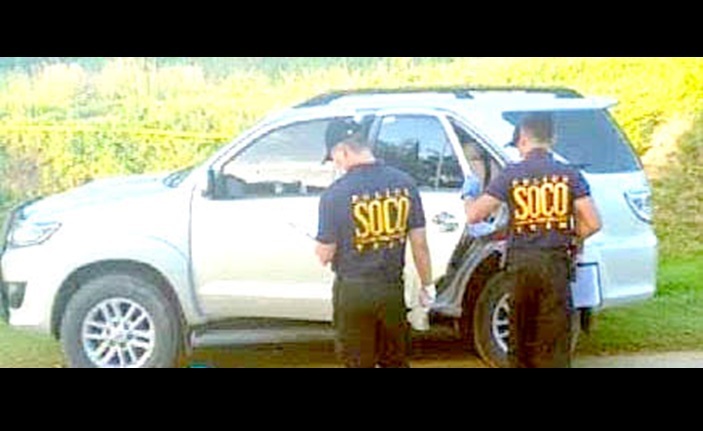 Police on Monday still filed murder and attempted murder cases against Anuengo before the Provincial Prosecutor’s Office for his alleged involvement in the gun attack against Cabarrubias which resulted in the death of the aspiring mayor’s driver, Conrado Aniasco. Article 89 of the Revised Penal Code (RPC) of the Philippines however stipulates that death extinguishes criminal liability. For his part, Supt. Conrado Manatad, chief of the BPPO’s Police Community Relations Branch, said that Cabarrubias’ work as a lawyer continued to be the top possible motive behind the ambush. Manatad however refused to elaborate on the said motive even after Cabarrubias’ recent identification of his would-be killer. The police official also did not comment on whether Anuengo and the still unidentified gunman acted on their own or were ordered to carry out the attack against Cabarrubias.